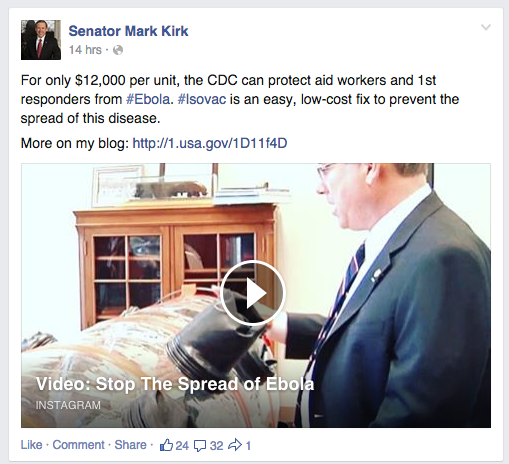 United States Senator Mark Kirk is out this morning with a really nice home-grown story about how an Illinois company called Isovac can be an easy, low-cost fix to prevent the spread of ebola. Great to see Senator Kirk taking action and even better that there could be help on the way from some innovators here in Illinois at Isovac. This week, I met with representatives from Isovac, an Illinois company that manufactures a Patient Isolation Unit (PIU) to keep medical personnel and first responders safe from exposure to Ebola when assisting patients who have contracted the disease. Due to the infectious nature of the Ebola virus, those who are caring for infected individuals are at a high risk of contracting the illness through direct contact with mucous membranes or broken skin. Isovac's containment units will keep our medical personnel safe as they work to contain infected patients. In a letter with Reps. Adam Kinzinger (R-Ill.-16), Aaron Schock (R-Ill.-18), Rodney Davis (R-Ill.-13) and Dan Lipinski (D-Ill.-03), I urged the CDC to use these units so that the men and women willing to place themselves in harm's way to fight this deadly disease remain safe from infection. Originally developed to protect U.S. troops from biochemical weapons in Iraq and Afghanistan, the PIU has since been shipped to members of the U.S. Air Force and NATO personnel stationed in the Azores Islands to preempt any type of patient evacuation or transport if the disease is contracted. Additional units have been sent to Scott Air Force Base for use by the 375th Air Mobility Wing. The chamber is fully equipped with an air filtration system, attached medical gloves and IV pouches. While in the PIU, the infected person is then completely contained and poses no threat to those caring for the individual en route to a medical center or hospital. The chamber is FDA-cleared, and if deployed by the CDC, could be sent to medical personnel and airport security across the world to prevent further spread of the disease to those caring for ill patients.